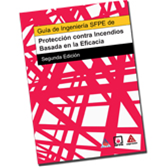 Stay at the forefront of fire and life safety with the Spanish SFPE Engineering Guide to Performance-Based Fire Protection, 2nd Edition. NFPA and the SFPE, the industry's leading authorities, have teamed up to create the 2nd edition of the respected SFPE Engineering Guide to Performance-Based Fire Protection. Developed in recognition of the increased acceptance of performance-based design, and including recent experience and advancements in computer modeling and engineering techniques, this edition is a vital tool for engineers, architects, building code officials, and AHJs. Determine and document the achievement of fire safety goals for a particular project over the life of a building. Identify and work within the latest accepted parameters that should be considered in performance-based analysis or design. Develop fire protection measures that ensure acceptable levels of safety, without unnecessary constraints on other aspects of building design or operation.